Dream-slip wrist bands are quality silicone, embossed with the words "Dream-slip," and are purple, like the color of this page. You can get them for free at book signings and other book events that Mike attends, or you can purchase them here. There are two sizes, one for adults and the other for youth (just a little smaller.) They come with a little card that explains what dream-slipping is and with the dream-slip spell to activate them. The spell is over on the left side of this page. Dream-slip (drēam-slĭp) v. dream-slipping, dream-slipped, dream-slips. To travel in one's dreams by way of magic. Unique to the world of Gabendoor. The book bags are heavy unbleached cotton bags with handles. Mike prints the graphics onto special printable fabric and applies them to the bags and stitches all the edges. He really does this himself. The bags have a picture of the book cover for "The Book of Second Chances, " and the words "Book Club Kit," or "Classroom Kit." Mike signs the bags. You can get either bag as part of a Classroom or Book Club package which include books, book marks and more at a special price. If you jut want a book bag, you can purchase it separately here. You can get individual Limited Edition trading cards at a book signing or other author events. Mike hands them out when he visits school classrooms, book clubs or at other special events. You can download the non-limited cards. If you really, really, want a signed set of the three limited edition cards, you can purchase them. Mike prints, signs and laminates them himself. 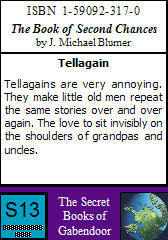 The limited cards are Molly Folly Sallyforth, Haggerwolf, and the Tellagain. Mike does all this himself and most of what he charges covers his costs and some of his time. He's a writer, not a merchant. Because of that, he doesn't take credit cards and you can't pay online. You can fill out an order blank, print a copy for yourself and mail him a check. When Mike gets the check, he'll ship your order to you right away. 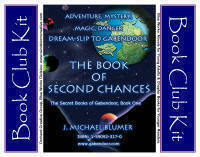 If you are ordering larger quantities, for a book club, classroom, library, etc., you can mark that on the order form. Be sure to include your email address and Mike will expedite the order. In those cases he can ship the order and invoice your organization later if you have a purchase order or something similar. If in doubt, email mike at Click here.